Nucor does things a little differently than most steel mills, and China could learn a thing or two. Nucor (NYSE:NUE) is one of the largest and most diversified steelmakers in the United States. It's turned a profit in all but one year of its existence. That's a key reason why China should be following Nucor's lead and distance itself from the model used by money losers like AK Steel (NYSE:AKS), which has been bleeding red ink since 2009. One of the many things to like about Nucor is that it's one of the largest recyclers in the U.S. market through its David J. Joseph subsidiary. This business does things like collecting old cars, stripping them of usable parts. and shredding them so the metal can be used to make more steel. That scrap is a key ingredient in Nucor's electric arc mills. This doesn't sound too exciting, but it's a big deal. Electric arc mills are cheaper to run and scrap is (usually) less expensive to use then iron ore. This is the basic model that Nucor's business is built on. It's hard to argue with the results, particularly now during a time of deep distress in the steel industry. For example, AK Steel uses older blast furnace technology (powered by coal) and the iron ore that producers like Cliffs Natural Resources (NYSE:CLF) digs out of the ground. The mill has lost money each year since the deep 2007 to 2009 recession ended. Nucor lost money in 2009, but has been profitable since -- even though the steel industry has been mired in a downturn since the recession. 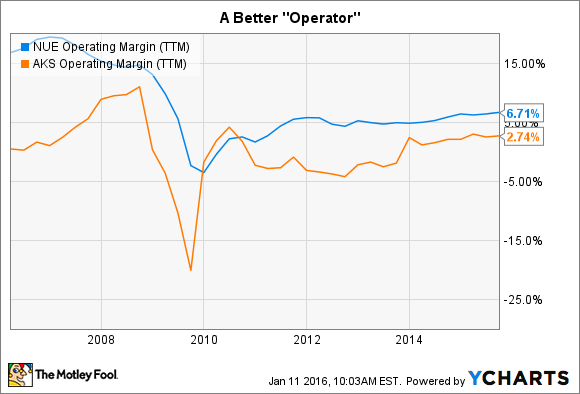 Looking at the issue from a different way, Nucor has historically had higher operating margins than AK Steel. Although the difference may not seem huge on an absolute basis, on a percentage basis the discrepancy is a pretty big deal. And it's made a massive impact on the bottom line. To be fair, Nucor doesn't elusively use scrap steel in its mills--no large steel company could. So the competitive benefits it enjoys are really from a combination of factors (including variable labor costs), but using scrap and more modern electric arc furnace technology are a key piece of the puzzle. NUE Operating Margin (TTM) data by YCharts. What's this have to do with China? China is the world's largest steel producer by a wide margin. The vast majority of its mills use blast furnaces, belching carbon from burning coal and eating up iron ore. That's the AK Steel way of doing things and it helps keep miners like BHP Billiton (NYSE:BHP) and Vale (NYSE:VALE), which serve the Chinese market, in business. What if it changed that up and did things the Nucor way? According to the U.S. Energy Information Administration, using scrap steel, which is the heart of the electric arc process, uses as much as 60% less energy than blast furnace technology (no wonder Nucor has wider margins than AK Steel). But that energy reduction has another positive in it because it means less coal is being burned. And using scrap means reducing the need to mine for iron ore while at the same time cleaning up the things, like cars and appliances, that society has tossed on the garbage heap. China needs to get on Nucor's scrap metal band wagon. Source: US EIA. A wholesale switch in China would be close to impossible, of course, which is good news for suppliers like BHP and Vale. Those two are already struggling with oversupply issues in coal and iron ore. And you need to produce steel from both iron ore and from scrap, anyway. But China is doing too much of one and not enough of the other. Look at the chart above, and you can see how badly imbalanced China's production profile is compared to the U.S. market. On some level, that's based on the fact that there simply wasn't enough scrap around in China to bother with (it imports scrap, as it were). But it's worth noting that the United States didn't get on the scrap and electric arc furnace bandwagon in a material way until the 1970s, when there was enough scrap that it was price competitive to use. China, however, has climbed the socioeconomic ladder very quickly and, at this point, produces more than three times as much scrap as it did in 2010. Which suggests now may be the time for the country to start following Nucor's lead. As an investor, your takeaway from this should be that Nucor is doing right now what China needs to increasingly do in the future: recycling scrap metal using environmentally friendly (or at least more friendly) electric arc technology. Such a shift would mark a material improvement in the Chinese steel industry. But, perhaps more important, Nucor has remained in the black through a particularly deep industry downturn because it already knows these things.